The opera is coming to Jerusalem! 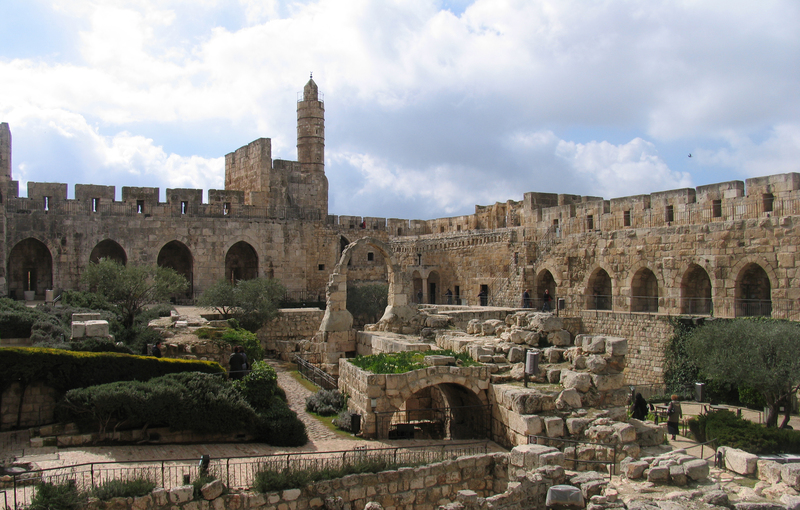 The Tower of David Museum and citadel is one of the historic sites where concerts will be performed during the opera festival in Jerusalem. Opera lovers now have a good reason to visit Jerusalem. Of all the historical sites where opera festivals take place in summer, Jerusalem may be the best, with its backdrop of the Old City walls and its many dramatic venues. This summer opera is coming to Jerusalem for a five-day festival, June 2 to 6, that will include the Israeli premiere of Verdi’s Jerusalem. The orchestra of the Arena di Verona, Italy’s leading summer opera festival, will open the festival under the baton of Italian conductor Giuliano Carella with a gala opera concert—Verdi, Puccini, and Rossini arias and duets—in the open-air Sultan’s Pool. A semi-staged production of Verdi’s Jerusalem with special lighting effects will be performed at the same site on the last night of the festival. David Stern, music director of the Tel Aviv-based New Israel Opera, is to lead the Jerusalem Symphony Orchestra, the New Israel Opera chorus, and international and Israeli soloists. The opera, in four acts, is set during the crusades to the Holy Land. It opens in France, moves to the city of Ramle, and finally reaches Jerusalem where the Crusaders are about to capture the city. Of course, there is a ridiculously complicated love story, with suspenseful twists, mistaken identities, and murder plots, as in other Verdi operas. Between these two major musical events, 30 chamber and vocal concerts will take place in dramatic historic settings, including the Tower of David Museum, the Dormition Abbey, and the Sisters of Zion Church in Ein Kerem. And while the opera festival takes place in Jerusalem, Verdi’s Aïda and his Requiem will be performed at the foot of Masada, near the Dead Sea. Text and photo copyright 2011 by Esther Hecht. No part of the text or photos may be used without written permission of the author. Harbingers of spring, these blossoms are proof that it pays to look up from your computer screen once in a while. Today I noticed a tree blooming in our garden, its pink petals holding firm in a fierce sandstorm. Almond trees have already bloomed elsewhere. 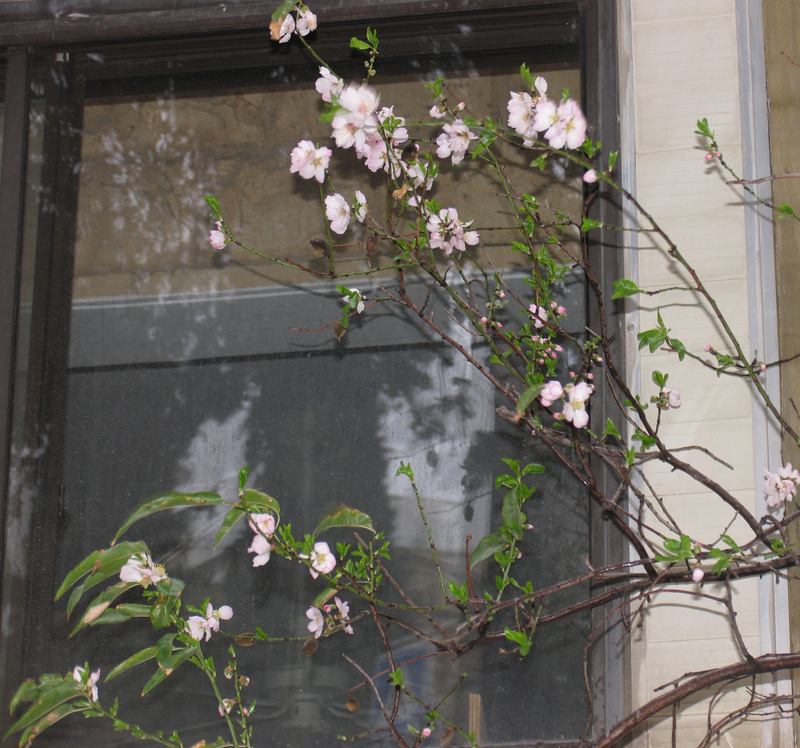 Their blossoms usually appear in time for Tu Bishvat, the New Year of the Trees (which fell on January 15 this year). That’s just one of four new years on the Jewish calendar. The others are the new year for kings and feasts (1 Nisan), the new year for the tithe of cattle (1 Elul), and “the new year for years, of the years of release and jubilee years, for the planting and for vegetables” (1 Tishrei). I don’t know how the new years of kings and cattle are celebrated, but the last of these is when many Jews remember that they belong to a synagogue. A 1943 Picasso painting, “Buste de Femme,” is to be exhibited at the International Academy of Art in Ramallah this April, according to the daily Ha’aretz. It is said to be the first time a Picasso masterpiece has been displayed in the Palestinian territories. The painting will be on loan from the Van Abbe Museum in Eindhoven, Holland, and Gaza-born filmmaker Rashid Masharawi plans to document the transport of the Picasso to Ramallah in a film titled Picasso Visits Palestine. The exhibition is to include paintings by 20th century artists. Ha’aretz reports that the aim of the show’s organizers is to present the reality of the territories, “the political and geographical space that is dictated by strategies of occupation.” The connection between that and the Picasso was not made clear. The academy, which opened with a three-year grant from the Norwegian Ministry of Foreign Affairs and began courses in September 2007, offers a four-year BA program in contemporary visual art. More than 500 runners from 30 countries are expected for Jerusalem’s first marathon, on March 25. Mayor Nir Barkat, a marathon runner, will be among the participants. The race has been dubbed the “Breathtaking Marathon,” both because of the hilly terrain and the spectacular sights. There will also be a 10k race and a 4.2k race to benefit charitable causes, including the Israel Cancer Association and Shalva, the Association for Mentally and Physically Challenged Children in Israel. The Tel Aviv Marathon is just two weeks later, on April 8. After today’s mail arrived with a notice from the Israeli postal service, I was about to write a crowing post about how I’d beaten the system, for once. Then I looked at the notice closely and realized I wasn’t victorious yet. The very simple story concerns a piece of registered letter containing a check that I mailed months ago. The postal service (privatized, of course, and now calling itself the Israel Postal Company), conceded that it had failed to deliver the mail and it agreed to compensate me. Today’s notice stated that the compensation had been transferred to my bank account on February 15. But it did not show up in that account. When I looked at the notice again, I saw that the compensation had been transferred to the wrong bank. Small wonder that they can’t get the mail delivered. After five phone calls and a fax this morning I still hope to see that compensation, but they’ve already told me that won’t be before February 28. Egypt has fallen off the front page as protests in other countries grab the media’s attention. Protests are sexier than their aftermath; they photograph better and they allow TV reporters to provide breathless running commentary. But without diminishing the achievement of Egypt’s (and Tunisia’s) protesters, one can see a much more difficult task ahead: preparing for a democratic (or other, workable) system of government. Some pundits in Israel and elsewhere have argued that Islam is inimical to democracy. One might say the same about Judaism, of course, but Shlomo Avineri, professor emeritus of the Hebrew University’s political science department, points out that even ultra-Orthodox Jews participate in Israeli democracy. In any case, Avineri argues, that is not the point. The important question is the degree to which the mechanisms needed for a democratic society are in place in Egypt. This will become evident in the months to come. A four-hour crash course on Islam and the Jews, held last week as continuing education for Israeli tour guides, was a refreshing eye-opener. 1) Muslim proponents of differing points of view cherry-pick supporting quotations from the Quran, just as Jews and Christians do from the Bible. 2) Parts of the Quran are associated with Muhammad’s Mecca period (610–622 CE) and parts with the Medina period (622–632 CE). The verses relating to Jews in the earlier period are mainly positive, whereas the verses from the later period are mainly negative. Take your pick. 3) The sobriquet “the People of the Book” in relation to the Jews appeared first in the Quran. 4) The Quran adopts some Old Testament terms, such as the names of paradise (Gan Eden) and hell (gehenom). 5) Jerusalem is sacred to Islam. It is not mentioned explicitly in the Quran, but sura (chapter) 17, verse 1 refers to al-Aqsa Mosque, which the commentary says is Jerusalem. Jerusalem may not have been considered sacred in the beginning, but that does not make it any less sacred now. The presence of an 11,000-year-old stone tower has led archaeologists to call ancient Jericho the oldest city on earth, even though it was actually only a settlement of hunter gatherers at the time. But why was the tower built in Jericho (some 24 miles northeast of Jerusalem)? Doctoral candidate Roy Liran and Dr. Ran Barkai of Tel Aviv University’s archaeology department say it was needed for protection from both physical and metaphysical dangers, but that the villagers had to be convinced to put in the huge effort required to erect it. To that end, an individual or group of individuals exploited the villagers’ fears of the dark to get them to construct the world’s first public building, while at the same time bolstering the political and social status of the initiators. The two researchers had previously suggested that the tower and the wall below it were cosmological markers aligned with Mt. Qarantal (the highest peak overlooking Jericho) and the shadow cast over the village on the longest day of the year. Now, in an article published in the journal Antiquity, the authors argue that a 3-D reconstruction reveals that the shadow hits the tower before dramatically swallowing up the entire village. “The tower was built … as a guardian against the dangers present in the darkness cast by a dying sun’s last rays of light,” they say. The current proposals are variations on the Hebrew three-letter root meaning “rot” or “decompose.” But according to Ronit Gadish, the academy’s scientific secretary, the negative connotations of those words get in the way of persuading the public to recycle its organic garbage. The noun would remain compost, a composter (the container) would be a mecampest, and composting would be ceempoost. And once again we would prove the robustness of Hebrew through its borrowings from other languages. So simple. 1) Two weeks into the uprising in Egypt I feel that as an outsider I understand much less than I thought I did a week ago. The two on-line friends in Egypt I had tried to reach got back to me after Internet service was restored and thanked me for my concern. They did not elaborate on the situation. If Egypt now has a free press, that is certainly a positive outcome. But it is hard to know what else to wish for the people; as in any country, they have many different views of what is best for them. One thing is certain: Egypt—like Israel—lives on tourism, and tourism requires stability. As the wife of a tour guide, I am keenly aware of this link. Pundits say that economics is a large factor in the unrest in Egypt; but as long as the unrest continues, tourists will stay away and the economic situation can only get worse. Please don’t destroy the pyramids. We won’t rebuild. 3) Every Passover we remember that we were slaves in Egypt. The Egyptians, however, don’t necessarily remember history that way. In 1967 I had an Egyptian neighbor in Cambridge, Massachusetts. On Passover I brought him and his wife a jar of haroseth I had made and then proceeded to explain about the holiday and the significance of that sweet concoction. He just looked at me aghast. “It can’t be,” he said. That difference between national narratives didn’t affect our friendship, however, and two months later the Six Day War forged an even closer bond between us: Our countries were at war with each other, but we were both far from home and desperate for information about our family and friends. 4) The Torah commands us, “You shall not oppress the stranger, for you know the soul of the stranger, having been strangers in the land of Egypt.” (Exodus 23:9). Some Israelis take that injunction to heart. One of them is Keren Tal, the principal of the Bialik-Roghozin School in Tel Aviv, most of whose 376 pupils are the children of migrant workers or asylum seekers. Of those 376, 120 live under threat of deportation and the remainder are awaiting decisions regarding their status. Three of those children are the subject of the film Strangers No More, by Karen Goodman and Kirk Simon, which has been nominated for an Oscar in the documentary (short subject) category. Watch for it at the Academy awards ceremony February 27. 5) Much of Israel is arid, and the level of the Sea of Galilee, the national reservoir, keeps dropping. Drought is an ever-present threat, but the lake’s receding shoreline has provided one boon: the discovery in 1986 of a 2,000-year-old boat dubbed the “Jesus Boat,” which after being restored became a major tourist attraction at the Adam Bagalil (Man in Galilee) Museum in Kibbutz Nof Ginosar, on the lake’s northwestern shore http://www.ginosar.co.il/en/village/attraction.cfm. Now, after years of talking about the need to maintain Israel’s water supply, the cabinet has approved an emergency plan to increase the production of desalinated water by operating desalination facilities around the clock. By 2013, Israel should be producing 420 million cubic meters of water—more than is drawn annually from the Sea of Galilee. The cabinet will also consider the construction of another desalination plant. One financial blogger recommends looking at water as an investment commodity. “Things that are in high demand and low supply often create wealth in the market,” he writes. What a lovely thought. Meanwhile, the price of water in Israel rose 33 percent in 2010, ostensibly to reduce consumption. Who felt the hike most? Those with the least income, of course, and not the investors making money from the privatization of what should be a national resource. A friend in the United States wrote yesterday to ask whether we’re concerned about the situation in Egypt. Here’s one answer: Yesterday I spoke to two Israelis who are very close to me. Both reported having had nightmares the previous night. In one dream, a sniper was methodically killing all the people in a house where the dreamer—the last live one alive—remained to guard something precious. In the second dream, an angry mob was pursuing the dreamer. Both dreamers blamed the situation in Egypt for their nightmares. Israel has much to be concerned about regarding its huge southern neighbor, which has more than 80 million inhabitants, many of them hungry for bread and not only for reforms. President Hosni Mubarak’s dramatic announcement that he would step down in November (which is not soon enough for the masses) should have been the lead story in today’s paper but was overshadowed by Israel’s failed attempt to appoint a new chief of staff. A smooth handover in the IDF was never more important, and this failure highlights, among other things, the complexities of democracy and the naiveté of anyone who thinks a dictatorship like Egypt can become democratic overnight. Last week, my immediate response to the situation in Egypt was to try to contact two women I’d met on-line, one through a copy editors forum and the other through a translation job. There was no response to my e-mail messages, and I knew I was unlikely to receive one because the Egyptian government had shut off the Internet, but I had to try. Talk on Israeli news programs about the shutting down of the Internet focused on the uses that had been made of the social media in getting young people out on the streets. And then, yesterday morning, I couldn’t access the Internet right here in Jerusalem. I couldn’t help thinking, for a second, what if this is spillover from Egypt? I had two urgent projects that were to arrive by e-mail; without the Internet I simply could not work. But it took no more than one (long) phone call to tech support to get hooked up again. Egypt must have millions of people like me who have not been able to do their work, let alone get the latest unofficial information about the political crisis. In our computer-dependent age, being cut off for a week or more is almost inconceivable. There is another minor personal angle to the Egypt story. The only part of Egypt I’ve visited is the Sinai Peninsula, and that was decades ago. Ever since I wrote about the grand Bibliotheca Alexandrina in 2000 when it was still under construction, I’ve been promising myself to go and see it. This was to be the year of the visit, but I’ll have to wait. And one more tidbit: Cairo University was established as a state institution in 1925, incorporating the private Egyptian University founded in 1908; it had colleges of arts, science, law, and engineering, as well as a medical school. The Hebrew University of Jerusalem (my alma mater) was established the same year, and Cairo University’s president, Prof. Ahmed Lutfi el-Sayed, attended the inaugural ceremonies. One of the participants at the inauguration, Dr. Selig Brodetsky, a mathematics professor at the University of Leeds and future president of the Hebrew University, passed through Cairo on his return to Leeds and addressed a teachers society. Meanwhile, however, Egypt’s universities and colleges are producing 800,000 graduates a year who have little hope of finding suitable jobs. And they are leading the revolution.